Jesus' speaking in parables raises several challenging questions. First, if it is true that people have always ignored or killed true prophets who have revealed the scandal of scapegoating, how did their writings become parts of the Jewish Holy Scriptures and, later, the Bible? As much as other people, the Hebrews were discomforted by prophets who revealed the scandal of "sacred" violence. However, the Hebrews differed from other people in that their monotheism provided a dim awareness that the prophets may have grasped some profound truths. This view would help explain why they saved and revered the prophetic writings, even as they shrunk from fully internalizing the later prophets' claims that God does not want sacrifices (Hosea 6:6; Jeremiah 6:20, 7:22; Amos 5:21-22; Micah 6:6-8). The Hebrews' recognition of the scapegoating process reached a peak with the Songs of the Suffering Servant. It is not remarkable that the Suffering Servant was a victim of scapegoating, which has been a universal phenomenon. What is striking is that Isaiah recognized the scapegoating process at work, an insight that qualifies Isaiah as a true prophet. Second, what did Matthew mean when he said that Jesus spoke in parables "to fulfill what was spoken by the prophet" (Matthew 13:35)? This relates to Psalm 78, in which the prophet Asaph wrote, "I will open my mouth in a parable; I will utter dark sayings from of old, things that we have heard and known, that our fathers have told us" (78:2-3). Asaph then described God's anger at the Hebrews' lack of faith after the Exodus from Egypt, while they lived in the wilderness. The Hebrews experienced much violence and death, which Asaph attributed to God. According to Asaph, the people's craving for flesh so angered God that God ". . . slew the strongest of them, and laid low the picked men of Israel" (78:31). This likely relates to Numbers 11:31-33, in which the Hebrews in the desert craved meat, even though there was plenty of manna. God provided abundant quail, and "While the meat was yet between their teeth, before it was consumed, the anger of the Lord was kindled against the people, and the Lord smote the people with a very great plague" (11:33). Perhaps the term "plague" was meant to describe a rash of violence that occurred because everyone attempted to grab as many quail as possible. It is possible that God was particularly displeased that the Hebrews craved flesh when there was ample non-animal food available. Just as Adam and Eve were not satisfied by the plant foods God had provided in Eden, the Hebrews in the desert desired what God did not want them to have. According to Asaph, recalling the "dark sayings from of old" will identify the Hebrews' past faithlessness and remind the Hebrews of the importance of keeping God's commandments (78:7-8). A Girardian reading indicates that faithlessness involves not trusting in God's judgment. Consequently, people "punish" according to their own human judgment, which invariably leads to scapegoating. Third, how can we recognize our own scapegoating? People have always found it easy to recognize when other people scapegoat; it is much more difficult to identify their own scapegoating, because they tend to regard their own violence as righteousness and justice. Perhaps the best way to avoid participating in scapegoating is to listen to the voice of the victims, but we resist hearing their stories, because doing so can make us aware of our personal failings and our own contributions to the strife that plagues our communities. It is easier to look upon past generations and condemn their victimization (e.g., America's crimes against Native Americans) than to acknowledge contemporary scapegoating (e.g., America's crimes against animals). A second way that we can avoid scapegoating is to remain mindful that it happens. If we find that our anger is growing, we must step back and, as detached as possible, assess the situation. An excellent strategy is to mentally put oneself in the place of those with whom we are angry and ask, "How would they describe the situation? How would they defend their actions?" Fourth, if the scapegoating process has been hidden since the foundation of the world, how have we come to recognize it? Girard has said that we have a book that fully articulates the scapegoating process - the Bible. Without it, we might be unable to recognize our participation. Fifth, why has it taken so long for us to recognize the scapegoating process, if the Bible so clearly describes it? Perhaps, because people have intuitively known that scapegoating has helped keep communities together, they have resisted internalizing Jesus' teaching that scapegoating is universal and scandalous. Christianity's non-sacrificial message has become more obvious as modern anthropologists have shown that analogous myths, rituals, and taboos have existed throughout the world, all of which have involved or related back to blood sacrifices. Upon recognizing that scapegoating is universal, we may more readily see how the Bible speaks to us when it exposes the scandal of scapegoating. Sixth, if Christianity has revealed the scapegoating process, why have Christians so often participated in scapegoating, e.g., against people of color, indigenous peoples, homosexuals, and animals? I think that, individually, we find it tempting to project our own anger and violence onto other people and believe that "punishing" them is just. Collectively, Christian communities have been drawn to myth, ritual, and taboo for similar reasons as other people throughout the world. Last, if scapegoating keeps communities together, are we doomed to widespread chaos and violence without scapegoating? I do not think so. In addition to revealing the problem - scapegoating - the Bible also offers ways that we may transcend this universal human tendency. For insight, we will look at several parables over the next few weeks. 1. Does the Flood contradict the view that God does not want to see Creation destroyed? 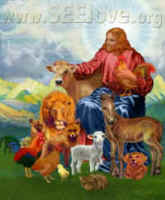 To my reading, God was dismayed by violence and saw no alternative to destroying most of the earth with a great flood. God's regret about taking such drastic measures was so great that God made a covenant with humankind and all the animals never to flood the earth again.